Joss Whedon drops some intriguing S.H.I.E.L.D. 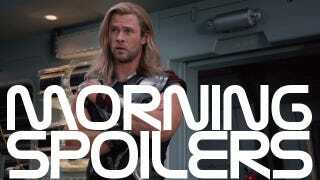 hints and promises The Avengers 2 will go deeper! J.J. Abrams explains why Star Trek Into Darkness had to be in 3D, despite his objections. Could some newly registered domain names hint at the new Batman movie? Jurassic Park IV is really happening — and it has a tentative release date in 2014. Plus John Noble talks the Fringe finale! "I've done the outline, I'm writing the script now and so the script should be done in a couple of months. I'm pretty excited about it, I have to say... Don't go bigger; go deeper. All of these people have met, so you have that out of the way. Now you can spend your time just digging in - and by digging in, I mean with a scalpel, to cause pain." The studio said, 'You have to make it in 3D if you're going to make it, for economic reasons.' But my feeling was I didn't like 3D. So the idea of doing Star Trek in 3D was ridiculous. But that was very helpful in some ways, because it let us work with stereographers and the 3D crew in a way that didn't assume we just loved 3D. I approached it very cynically. And the fact is that we've been using techniques that haven't been used before in 3D. They've figured out things. They've made enough movies now with this new process that they can understand ways to eliminate some of these problems. Things like breaking shots into zones, 3D zones, using multiple virtual cameras. A lot of this has made me a believer, whereas before I was really against it… There's this myth that if you don't shoot the movie in 3D it doesn't look good. Actually, the opposite can be true... The key for me is I got to make my 2D movie that I wanted to make, just the way I wanted to; and it gets to be augmented in 3D but that doesn't detract from the 2D. No, it's not. That is a complete rumor. I don't know where that started. Literally, Channing shot for - if I have it wrong, I'm off by an hour - four hours, five hours? So it wasn't really about that at all... [The new cut is] not much different. Literally, we shot for three extra days. We just added sort of explanation in what we did afterwards. "[Universal] finally came forward and said, 'You're absolutely right. The previous regime has missed the boat here. We want to pick it up. We're going to buy the rights and we're going to be serious about it and make a quality with A-director and with A-writers and so on. And we want you to participate in this. We want you to star and you to play Conan. We're going to take a story where Conan is at that age so it's totally believable and you're not looking like a 30-year old action guy.'" Well, a couple of weeks ago or months ago, I did make a couple of phone calls to test, to gauge the possibility of doing that because it's a big movie. There's no takers for a movie of that size. The two movies made their money back and a little bit. They were financially good, but one was fifty and the other one was eighty, eighty five. This is a hundred and forty. So no one wants to do that leap, from the financial side. So unless we find a way to do the mother of all kick starters. "We know there's something radical that has to happen in order to beat the Observers. I think by now we've built up to the fact that possibly, maybe Walter has to do something pretty outstanding to make this happen. More importantly, I think what you'll find is the way his relationship with Peter plays out in the next two episodes, and particularly the finale, is really quite remarkable. That's something we had to do because we spent so much time, and I know the fans loved the relationship between Peter and Walter so much. We certainly paid homage to that and brought it home, I believe, pretty strongly. I would have liked to have had an episode with each of the characters. I do have some beautiful moments with Jasika [Nicole] and Anna [Torv] as well. It's good story-writing in the sense that they've built this big arc and they're going to pay it out. I'm not going to tell you exactly what happens, obviously, but we do get the payout." "You've got to bring a little bit of spectacle to it. It's gotta be bigger than your average cop show, but at the end of the day it's about the peripheral people, it's about the people on the edges of the grand adventures. The whole point of this show is that even with all these big things, the little things matter. So it's about people who don't have super powers. There will be some people with powers, there will be effects, the spectacle of Science Fiction story telling, but all played on a very human/small level." The episode I scripted for the third season of HBO's GAME OF THRONES has been retitled. It was formerly "Autumn Storms," which I never much liked… but the episode did have a lot of rain in it. The rain went away. So did the title. The episode is now "Chains." I like that better. And it works on both a literal and metaphorical level. It will still be the seventh show of the season, episode 307. - Brooke will be playing Lothar Frey. Going against the book description with this one, but Brooke should be awesome in the role nonetheless. - Stephanie Blacker will be playing "Violet". Blacker's Violet could be a combination of Val and Dalla, or perhaps a Tyrell cousin or even some Riverrun maiden.... We will have to wait and see. - Burn Gorman will be a Night's Watchman, however the exact role is unknown. Considering when Gorman was in Dublin it is assumed he is one of the Watch traveling with Mormont and Samwell. think there are going to be moments when she does revert back to that little girl. As much pain as her mother has caused, at the end of the day, she is her mother and she loves her. I think that's true for a lot of parent/children relationships. Even when they go awry or horrible betrayals take place, there's a connection that's undeniable and that could never be broken by anyone. So, I want to make sure that that's there even through the fighting, even if we're throwing fireballs at one another. So much so that she blames Snow White (Ginnifer Goodwin) for Daniel's (Noah Bean) death when she saw her mother rip Daniel's heart out right in front of her and crush it. Children, a lot of times, can't make their parents wrong because they have to live with them, because they have to love them. And when you're young, you can't get on your Big Wheel and go down to the Best Western. You've got to live there and you've got to figure it out. I think that she's done that often with her mom. She's made a lot of excuses and has blamed others so she can still coexist and love her mother and feel loved, even though it's a demented sort of unhealthy love. And then there's going to be moments of the Evil Queen. But I think it's going to be different. It has to be. She's grown up in a different way. Now that she's lost everything and she's had this huge revelation, she's going to have to find a new way to deal with Cora. Here's a sneak peek at this Thursday's episode, "After School Special." "I don't know what the future [of Tron: Uprising] is now. I know at the present, I can say we need more viewers. I'm so proud of that show and I love that show and anyone who watches it loves that show. The problem is, not enough people are watching it. And so I would love to sound the alarm, because I love the characters and the world and it's really… It's a shame that more people aren't watching it, because I think they're missing out...At this point, I don't believe its fate has been decided. So if people keep watching, then there's still a chance. Please watch. Tell your friends!"